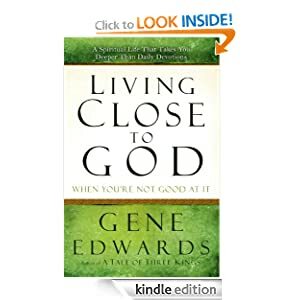 Gene Edwards gives us a book in Living Close to God (When You’re Not Good at It): A Spiritual Life That Takes You Deeper Than Daily Devotions that takes us with him through his journey to a closer relationship with God. Edwards points out several ways to make God a part of your everyday life and how to make sure that you are learning how to have a really deep and personal relationship with your Savior whether or not that is your natural inclination. Edwards shares several ideas for how to incorporate aspects of our physical lives into ways to enrich our spiritual lives. He talks about walking and eating and how these things can relate us back to God throughout the day. One of the main points that Edwards points out is that a relationship with God is not only for the learned or the educated. Rather, Jesus came and ministered to those who had never had a formal education and could not read the Scriptures for themselves. He taught even them how to walk with Him and how to truly know Him. So, in our day and age, there is no reason to believe that one must be educated or have a deep knowledge of theological concepts in order to know and walk with God. Rather, there are lots of simple ways to develop a relationship with the God of the universe by learning how to use scripture to talk with Him, by learning how to walk and slow your heart so that you can reflect and dwell on Him, by putting reminders in little places so you will stop and think about Him, by putting a song in your heart so you are constantly praising Him. These are some of the ideas that Edwards shares to help us learn how to commune better with God. I have to say that when I first started this book, I was really excited about it. I felt like this was the kind of book that I needed right about now, something that would re-invigorate my love and desire for God. I will say, though, that I was rather disappointed with this book. I think that there are a couple of reasons for this. To begin with, I personally did not appreciate the literary style of the book. I am not saying that it was poorly written, but it is not a style that I appreciate. The author tended to repeat himself and give emphasis in places where I felt it was unnecessary. It read to me like a book written for simple people. Perhaps that was the aim of the book, and there is absolutely no problem with that. I just do not enjoy books written down to an audience. The other problem with this book is that I think it is very difficult for an author to adequately write about a spiritual experience in a way that his audience can understand and share without cheapening or lessening the importance of the experience. I am not doubting Edwards’ journey to a deeper relationship with God, but there is something that happens between his heart and the paper that makes it difficult for that journey to retain the intensity and the excitement that it must have had for him. I don’t think this is a foreign concept. Surely you have experienced moments which to you were tremendously meaningful, but when you go to tell your friends, you cannot do the moment justice. I felt like this was a bit of a problem with the book. In trying to describe a relationship building with God, it is hard to write that in a way that other people are going to understand, because of the very fact that what has happened is special between you and God. The final thing that I will say in critique of this book is that I was very disappointed with the final chapter. I am not sure what background Edwards is coming from in writing this book, but he spoke negatively about the church in the final chapter saying that if you strive to have a deep relationship with God, the church may cause problems for you, because there are people that don’t want you to actually know God, but rather to just go along with what has been prescribed. I am not saying that the church is perfect, but I do hope that in the true church, the true body of Christ, those who have believed in Him, His death and resurrection, and the fact that only faith in Him can secure eternal life, and that are living in expectant hope of His return, that there is a desire for every believer to have a vibrant and real relationship with God. I personally would not recommend this book, though my reasons are mainly personal with the exception of the last chapter. I would not say that the writing of this book is anti-Biblical by any means, it just was not a book I enjoyed or found extremely helpful in my Christian life. I received this book for free from WaterBrook Multnomah Publishing Group to review. I received it through their Blogging for Books program which allows bloggers to sign up and receive free books in order to write reviews for the Publishing house. All thoughts and opinions are my own. Thank you for this honest and candid review.